Sports Costs > How Much Does the Golf Driving Range Cost? How Much Does the Golf Driving Range Cost? A driving range is a great way to work on your golf game as it allows for repetition and perfecting your swing, and the way you usually pay at the driving range is normally by the bucket of balls. These buckets can come in different sizes, and this is usually the main pricing factor. How much does a golf driving range cost? The cost of the driving range is going to depend on a few factors. These factors are going to include your geographical location, the number of balls you want and the type of range that you are at. On average, a bucket of balls is going to cost anywhere from $2 to $15 per bucket. The more balls you want to hit, the more you are going to likely pay. In higher-end areas such as New York City, do not be surprised to pay as much as $25 per bucket in touristy areas. Some driving ranges will charge by the hour rather than the balls. While rare, you can find them. If this is the case, plan on spending $8 to $22 per hour. According to a forum thread on TheSandTrap.com, forum members said they had paid anywhere from $3 to as much as $10 for a bucket of balls. Some members also claimed they paid around $30 per month for unlimited range access. Again, while rare, there are some ranges that allow endless range access for the month. Monthly prices can range from $30 to $75 per month, depending on the course. Keep in mind that most courses do not have this option. The Fairview Golf Center, located in New York, for example, charges only $7 to $12 per bucket. They also offer $5 buckets for police officers, military, educators and firefighters. At the Carlsbad Golf Center, they list their prices on their official website, with a jumbo bucket retailing for $16, whereas a small bucket can cost $4. The Stanford Golf Course charges $3 per 25 balls for the public and $2.50 per 25 balls for affiliates. Buckets of balls, on average, will include anywhere from 50 to as many as 200 balls. 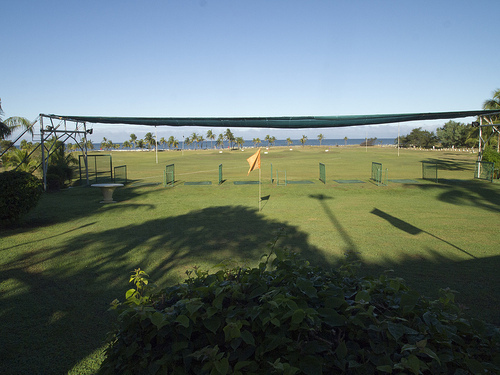 Driving ranges will often break them down into three sizes: small, medium and large. Depending on the driving range, some have two floors while others just have the ground. The lower tees often have the top floors to protect from the sun, rain and weather in general. In some location, there are golf ranges that even have heated sections. Some driving ranges are inside a golf dome. This allows you to hit a bucket of balls even during bad weather or the winter season. However, covered driving ranges may cost a little more than outdoor ones. Some driving ranges have putting greens where you can practice your putting skills. Each driving range will have signs about every 50 yards, along with varying holes and flags, so you can see the distance you are hitting the ball. The greens also help you perfect your shot as you use your irons or wedges. While some driving ranges have the equipment needed to hit the balls, some may charge a small fee if you want to rent gloves or clubs. The same can be said with any other equipment. Most of the time, however, you can borrow clubs, if available, for free. Driving ranges may have weather restrictions. Be sure to call the range before you go if the weather is bad since some may be closed. Most, if not all golfing ranges, have frequent golfing clubs. Generally, the more you golf, the more rounds you can get for free. For instance, for every 10 buckets you purchase, you may get a bucket for free. The range will usually keep track of this when they stamp your card each time you come in. See if the golf range you go to has any sort of discount like this. Consider purchasing a monthly pass if the course offers it. Some driving ranges allow you to purchase a monthly pass that allows you for golfing a certain number of times throughout the month for a fixed price. Some ranges may offer discounts for particular groups such as the military, senior citizens or teachers, or even offer discounts during certain parts of the day. Generally, the early morning on a weekday will be your cheapest time to golf.